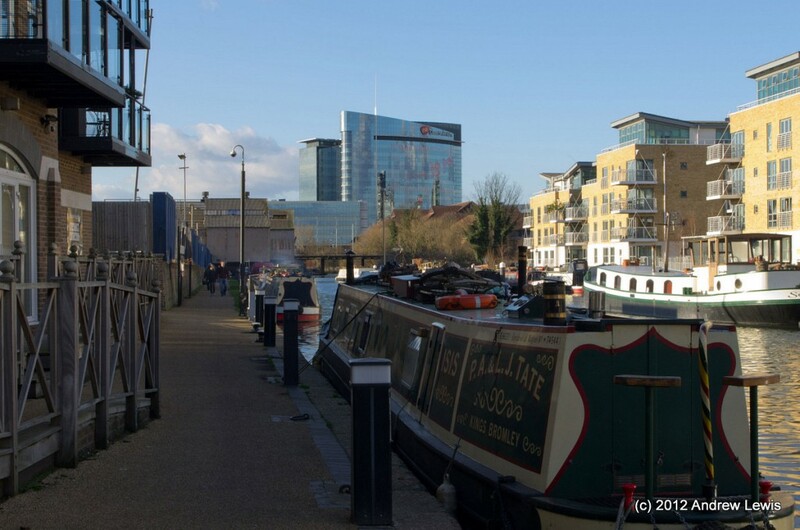 This walk was the first of my planned walks to complete the easily accessible parts of the Grand Union Canal (accessible meaning ‘close enough to where I live to get there and back by public transport’). 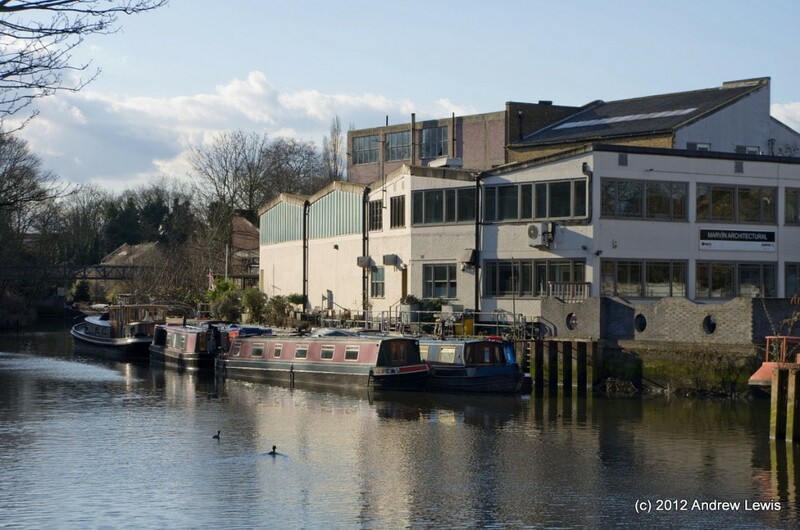 The walk starts at the southern end of the Grand Union Canal at Brentford, where it connects with the Thames, opposite Kew Gardens. (Click each picture to see a larger version). 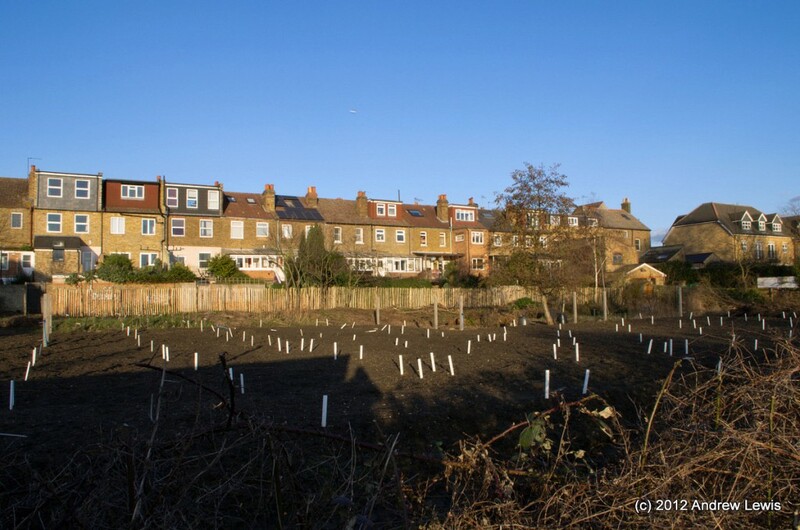 The actual start is a little tricky to get to as it is within a private housing estate. However, afterwards, the paths are all public and easy to follow. 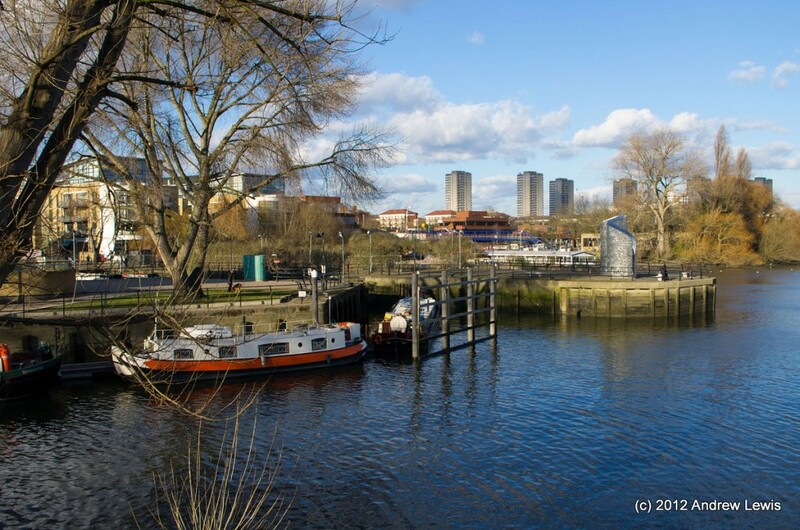 From the junction with the Thames, the start is actually in the form of the River Brent, as far as the Thames Lock. 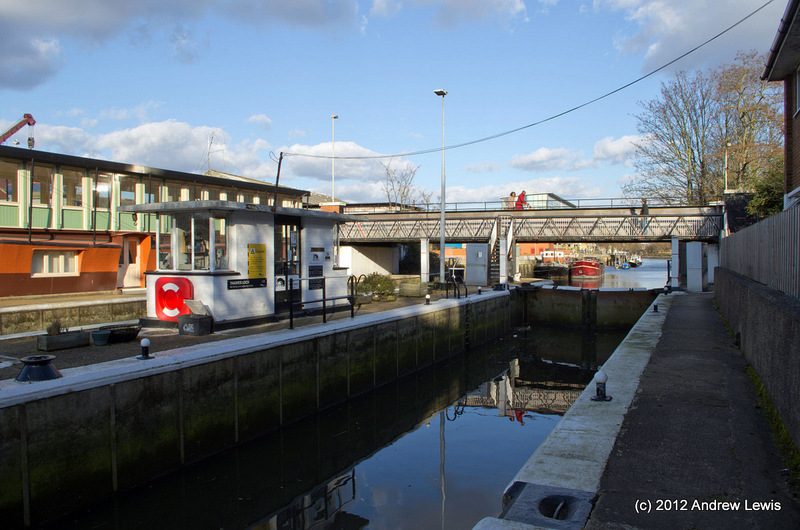 You can stay on the southern path of the canal for only a short while, then it is necessary to cross over a footbridge to the northern towpath. 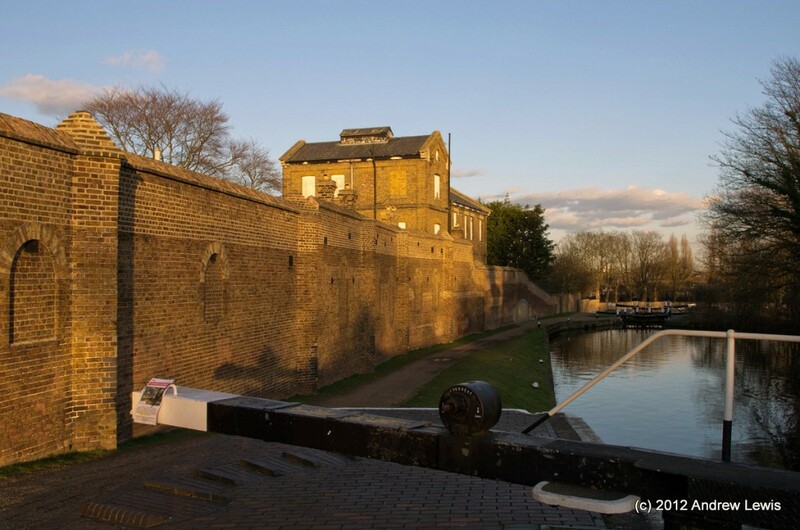 The canal curves around to the north as it approaches the road bridge at Brentford, necessitating a return to the road level to cross and then descend again, this time on the opposite back (now the western towpath) as we approach Brentford Gauging Locks. 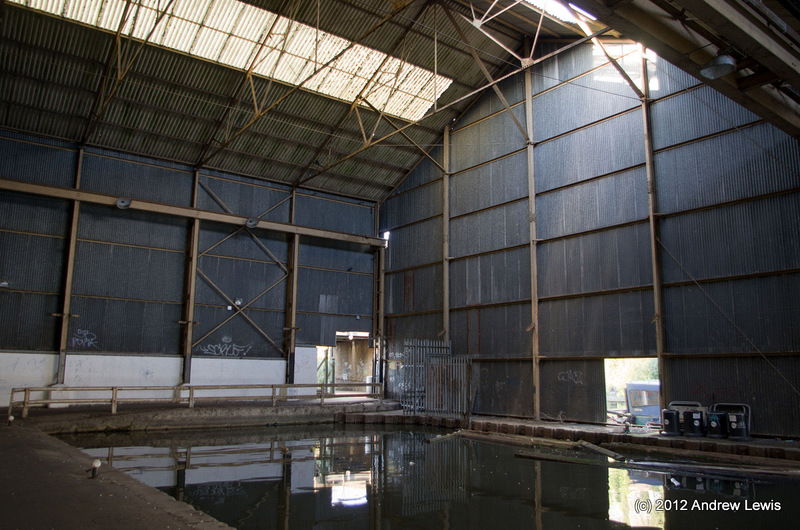 After the locks, the canal widens considerably into a small marina and then the towpath passes up to and inside derelict British Waterways sheds – enormous sheet metal blocks, echoing to the various noises, such as dripping water, and the feet of birds walking on the roof. 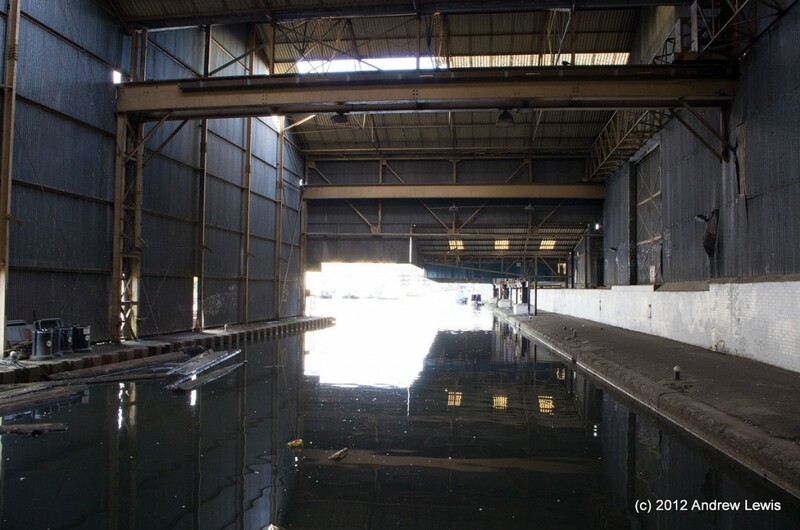 There are no barriers or signs, the towpath simply enters the end of one shed, then follows the water’s edge until it turns a corner and exits through a doorway to the north. 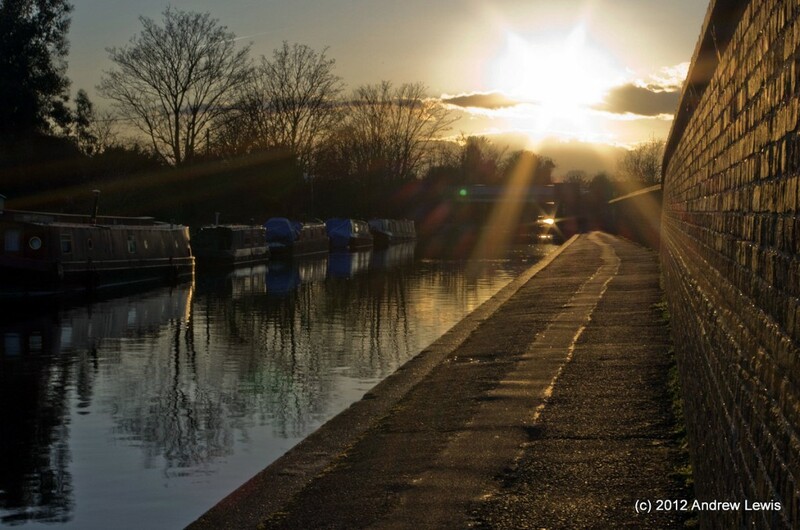 Looking backwards, the canal can bee seen in the shadow of the sheds and the small marina with the new housing lit by the afternoon sun. 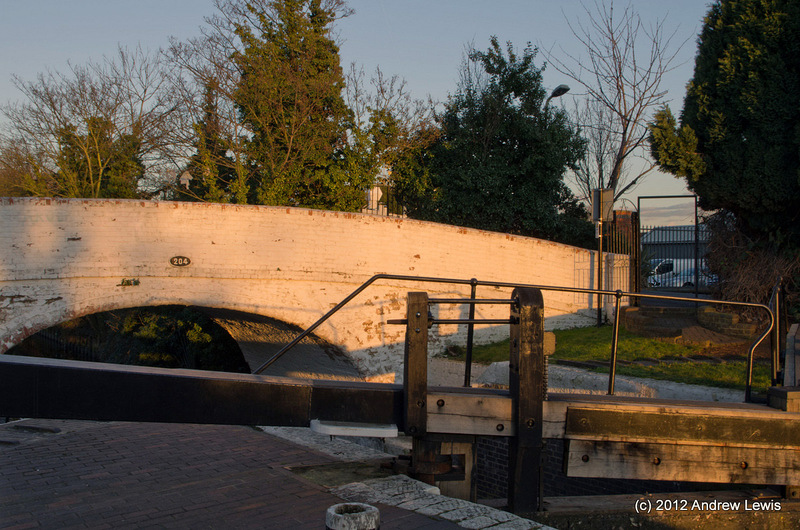 One or two small rail and road bridges cross the canal as the walk continues northwards, with the River Brent making the occasional re-appearance as a separate entity from the canal. The first of several weirs comes into view near the first lock after Brentford – Clitheroe’s lock. 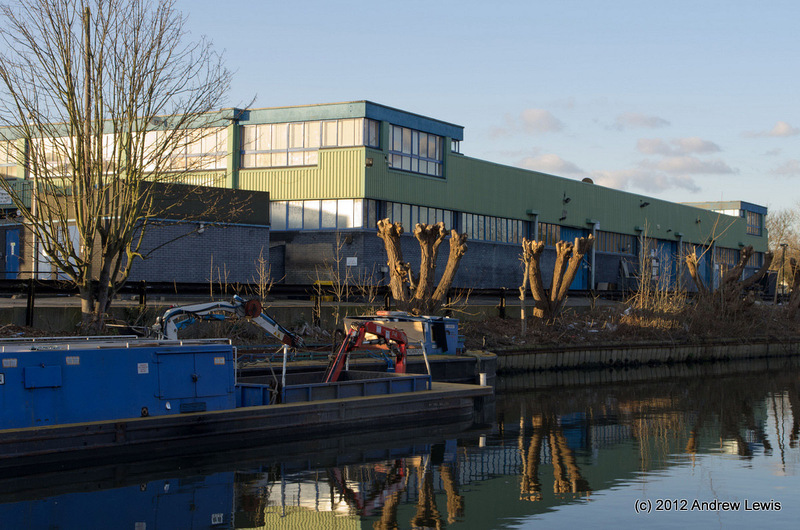 Despite the presence of a major road (the A4), the scenery is quite pleasant with plenty of trees and plants at the water’s edge, though there are one or two large pharmaceutical buildings on the north bank, but with an interesting water-cooling plant that uses canal water. After a slight bend to the left, the cast iron Gallows Bridge (207) comes into view and here the walker once again has to swap towpaths, this time crossing the bridge to the northern towpath, which can now be followed as far north as Cowley. 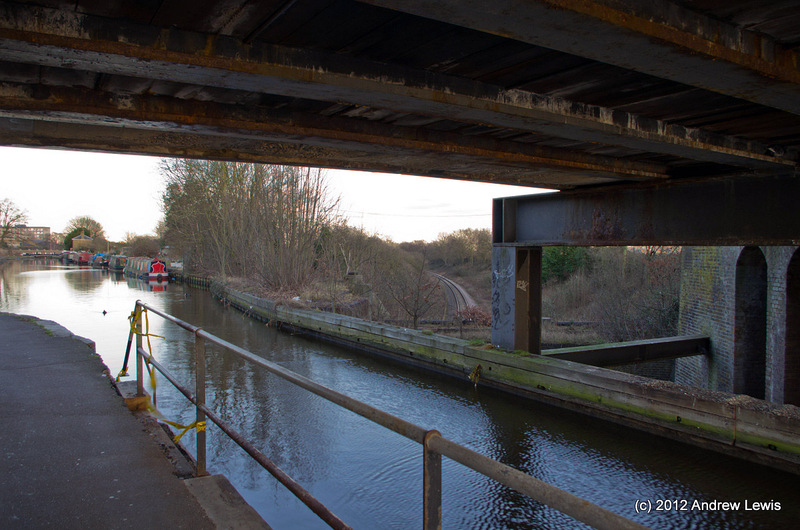 Next a small rail bridge crosses the canal, followed by a bridge carrying the M4 westbound through Osterley park. 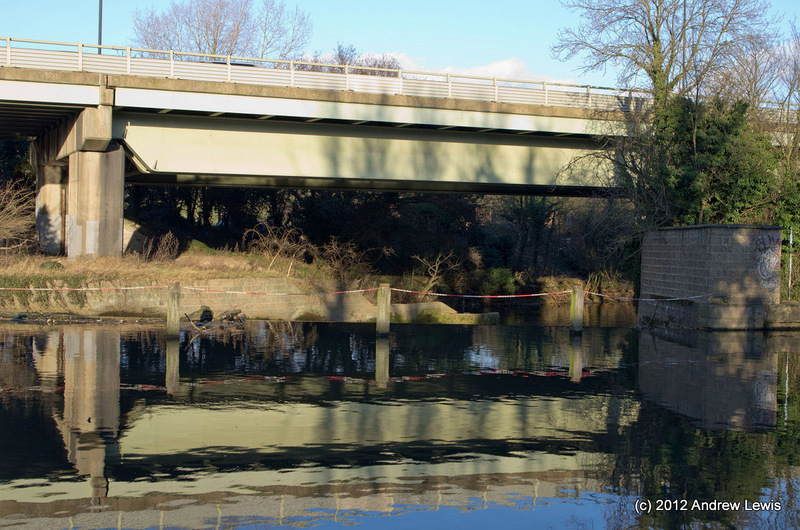 Shortly after the M4 bridge, another weir is visible marking the return of the Brent River. Near to the Ontario Bridge (205A) there is a small industrial estate and through the estate one can reach an unguarded pedestrian crossing, over a small branch of a railway, which leads to a path beside sports pitches, west to Windmill Lane, form where, a little way to the south, there is a route across fields to Osterley Park. Meanwhile, the canal continues north before curving gently to the west, to start the ascent up the Hanwell flight of 7 locks (91-97). 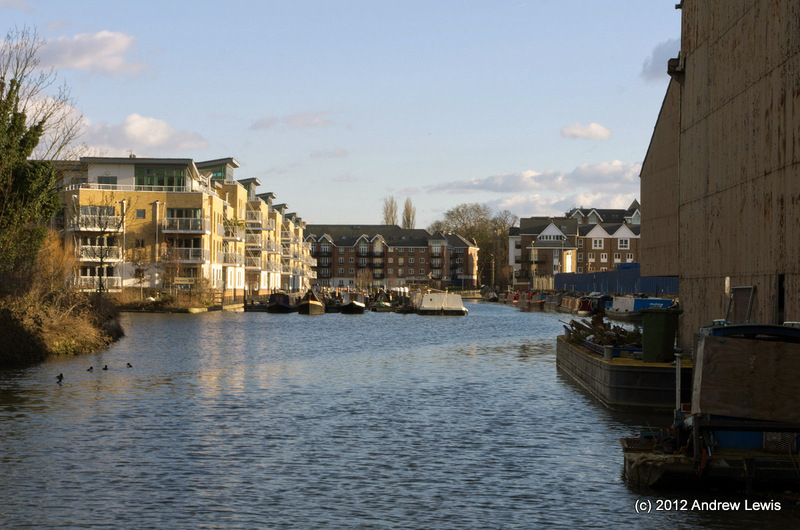 Just before reaching the first of the locks, land immediately to the north of the canal is undergoing development and several new houses are already built with plots being laid out for further construction. I guess the residents of the houses further back are about to lose their view. 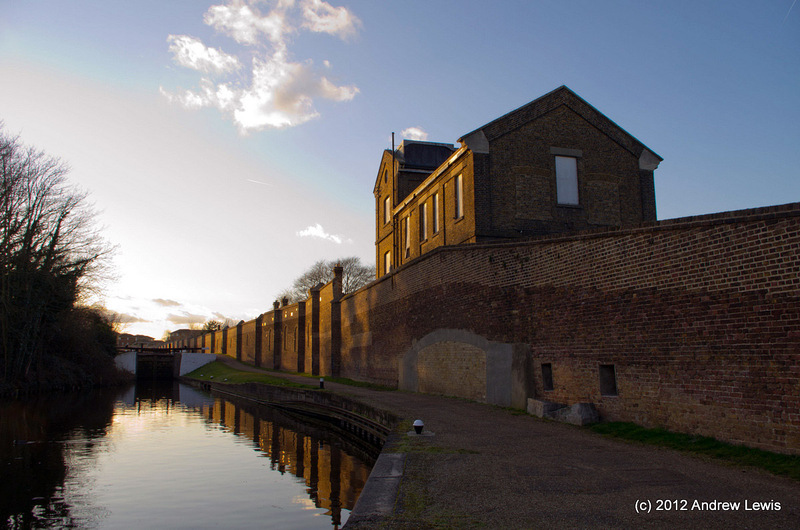 On a late afternoon, when approaching the Hanwell locks, the setting sun will be slightly to the left of the route of the canal and the golden rays illuminate the old brickwork of the wall by the side of Ealing hospital. 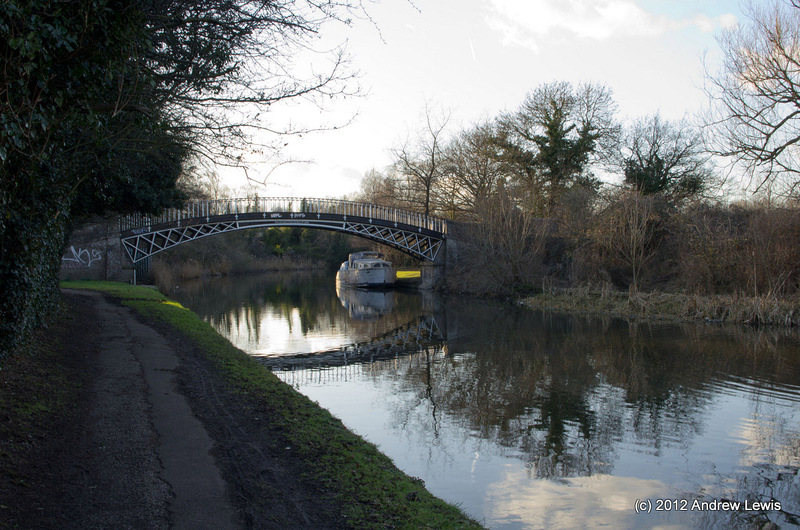 On the cold day of this particular walk, there was almost nobody around, but on previous times I have ascended the Hanwell flight, it has been busy with boats ascending and descending the locks, volunteers helping to keep the canal running, and people watching from the towpath. 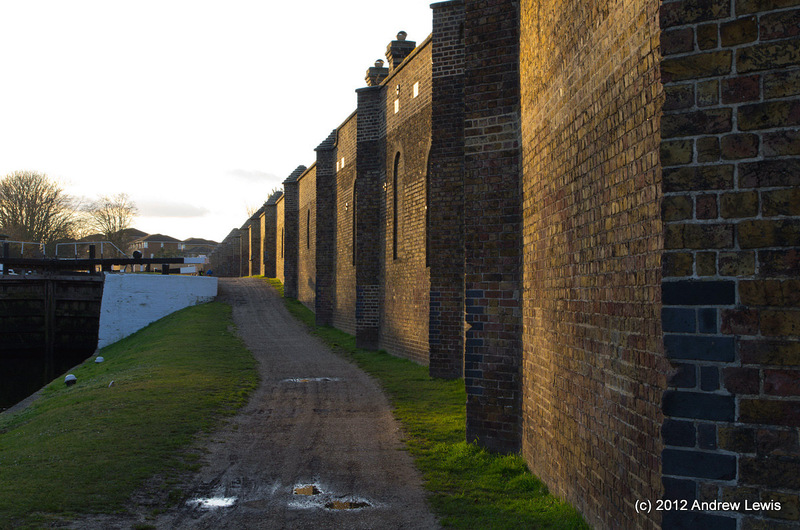 On this day, the sun was almost too low behind the trees in the west to illuminate the walls and the canal looked cold. 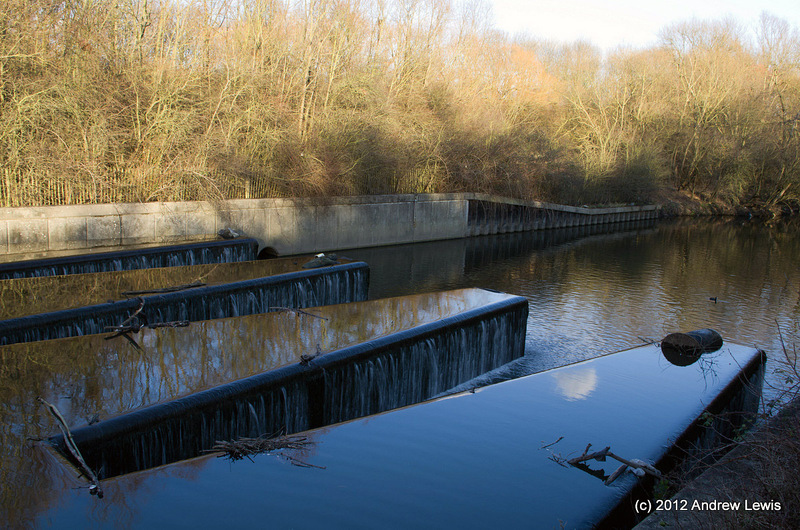 The lack of boat traffic could be seen in the stagnation of the water upstream of each lock, where layers of green weed supported detritus that had collected at each lock gate. 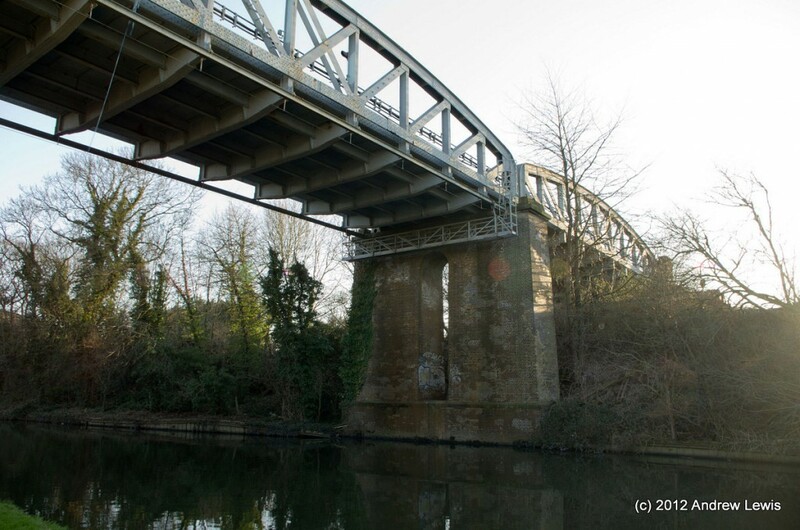 At the top of the Hanwell flight, there is a short run on the level underneath the famous ‘Three Bridges’ where road crosses over canal which crosses over rail. To the south, the road joins with Windmill Lane. On the lowest level, the railway branch line continues south-east towards the industrial estate and the unmanned crossing. 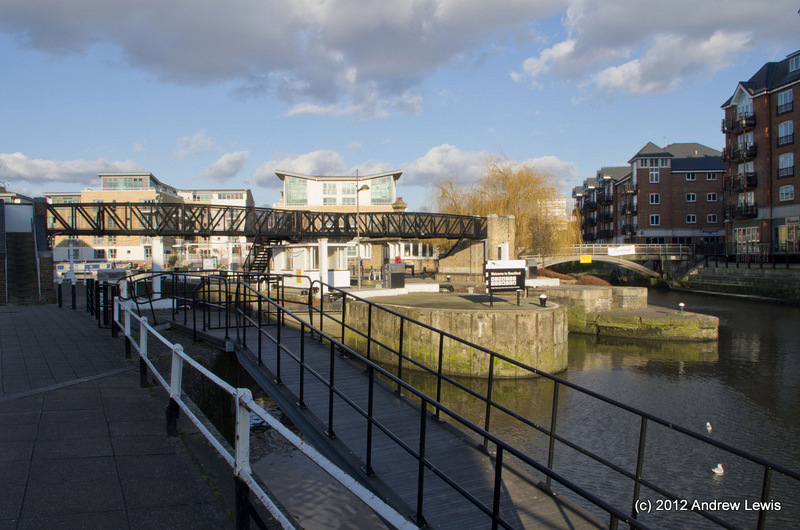 Shortly after the triple bridge comes the pretty Glad Lane Bridge (204), followed immediately by Norwood Top lock (90). By leaving the canal at his point, there is a nice short walk initially along residential roads (Melbury, Minterne, then a short way along the A4127 towards Norwood Green, as far as The Plough Inn, where there is a path running by the side of the pub, which leads to a public footpath between houses and then out onto a path which crosses fields, towards the M4. 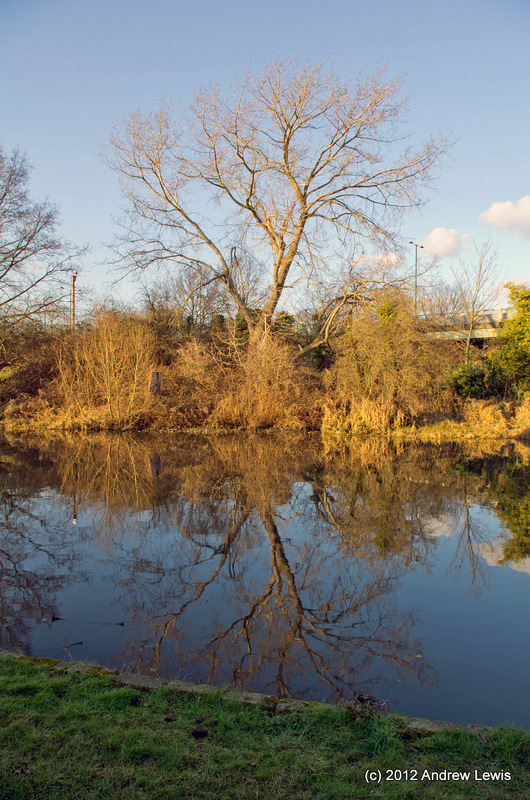 A bridge over the M4 allows access to a pathway into Osterley Park. 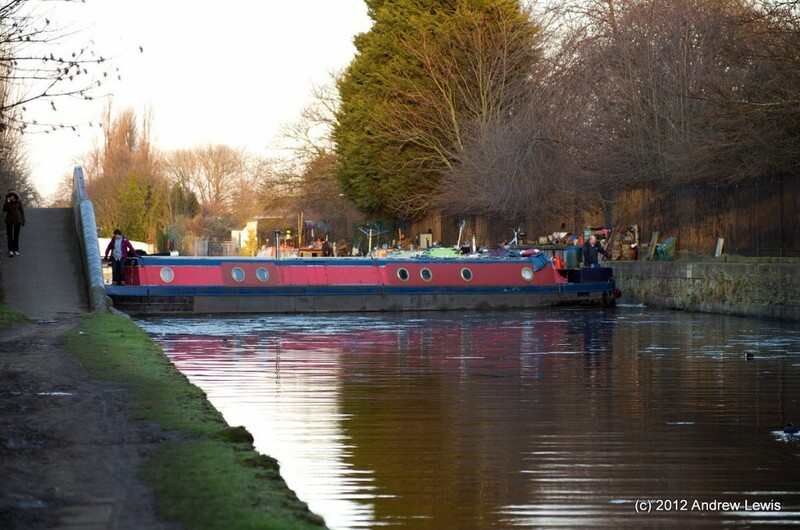 Today, however, I wanted to continue as far as possible along the canal so I pushed onwards, along a long straight section, and watched a boat turning in the narrow width of the can, to head off down a small tributary to the north. 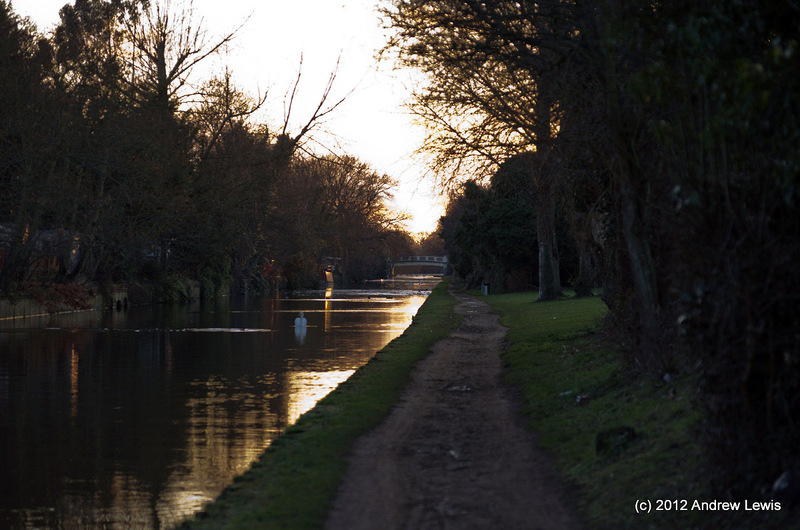 I continued along this straight section, looking at the map and working out where I was going to leave the canal. In the distance I could see Wolf Bridge (203) and the map showed that my initial objective for the end of the walk, namely Bull’s Bridge was the best part of a mile further along. Well, by now, the light was fading and I had to think about finding transport back to home. I left the canal at the Wolf Bridge (203) and headed north to find a bus stop to take me towards Hounslow and then a bus home to Teddington. I was using my Android phone and Google’s MyTracks to follow the progress of the walk. According to the GPS unit I had travelled over 11 km or just under 7 miles, for this section of the canal.